My goal is never to copy. She was born at a time when the countdown to the esthetic disaster of our age started and died by the time the disaster had finally managed to cover the Western civilization in a way similar to Christo covering buildings and places with fabrics. Have you ever heard of Tamara de Lempicka? Well, she managed to become a millionaire in her lifetime without any government grants or subsidies and worked her way up against all odds, particularly the Avant-garde “created” by mainly Marxist artists and intellectuals, best represented by that “work of art” of Kazimit Malevitch (1878-1935) known as “Black square on white background”, a feat that shattered his brain for the rest of his life. Lempicka’s dedication and work parallels Howard Roark, the hero of Ayn Rand’s “The Fountainhead”. Her canvasses were dedicated to beauty, to elegance and to purpose, three elements that flow from each of her works to the beholder. Reviewers of the art she produced had to recognize that in a gallery filled with hundreds of painting, all of different motives, styles and authors, the visitor will first and immediately look at the paintings of Tamara de Lempicka. Contemplating a work of Lempicka generates the peculiar feeling described by Rand in her “The Psycho-Epistemology of Art” that the pleasure is so intense, so deeply personal, that we experience it as a self-sufficient, self-justifying primary, resenting or resisting any suggestion to analyze it. Such a suggestion has the quality of an attack on the identity of the beholder, on his deepest, essential self. The sensation of “This is how the world should be” comes up, clearly and unmistakably. Since books have been written on her life (which included quite a few scandals that helped to raise her popularity among the buyers of her works, such as her evident hetero-bisexuality and the bizarre parties she produced where the servant maids took off one piece of clothing after the other with every tray of hors d’oeuvres emptied until they remained completely naked) and there are sufficient pages in the Internet showing her works, it needs but the most essential biographical data to describe her life. She was born in 1898, though she carefully hid the exact year, a characteristic of female coquetry and an addition to create her own image as a femme fatale, as the daughter of a Polish mother and a Russian-Jewish father. She came to Paris at the end of the First World War, one more of the many destitute Russian emigrants of the time. Under the pressure of having to find a means of sustenance for her, her husband, who was at the time unable to find a suitable occupation, and her daughter Kizette, she resumed the study of artistic painting, begun earlier in St. Petersburg, with Maurice Denis, a Symbolist and André Lhote, a noted Cubist. Of both, however, she accepted only their teachings in painting technique, creating her own style, which was to be unique. By 1923 she presented some of her works at the “Salon d’Automne”, which meant the beginning of her success. 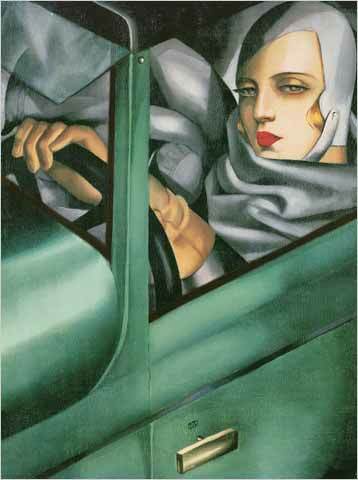 From there on until 1939, when the clouds of the coming war closed over the world, Lempicka, a sturdy anti-Communist working in the predominantly Marxist Avant-garde environment of Paris, which had been launched at the end of the foregoing century, built a flaming road of absolute beauty, technical perfection and deep sensibility. The outpour of her production was tremendous, working generally at night, and her style so totally personal that art critics, unable to determine what current she followed finally placed her among the Art Deco artists, though this constituted a total misnomer for her works of art. After divorcing her husband and marrying one of the enthusiastic collectors of her painting, the much older Baron Kuffner, she moved to the United States at the outset of World War II. By the time she settled there her success waned, drown by the waves of Non-Objective Art and Abstract Expressionism, the offsprings of the European Avant-garde which already dominated the scene of American the art galleries. For a time she played with abstractions and Surrealism, to then return to her own concept of what painting really is and represents. But even in these few works the spectator will notice the precision of the lines and forms painted. By 1972 the younger generation of gallery owners in Europe came to her and enticed her to show what could be termed her traditional way of painting at a special exhibition in Paris. This triggered her comeback and the recognition of her worth by the world of art. Age, however, was taking its final toll. By the end of the seventies she retired to Cuervanaca, Mexico, a place that hugged her fantasy, where she died in her sleep in 1980. Following her last wish, her ashes were strewn over the top of the volcano Popocatepetl. What remains for us is the wonder of her paintings, the precision of the forms, the abundance and strength of her colors, the psychological depth of every face, every figure and every scene she depicted, the perfection of her message, the rendering of what Aristotle wanted: the human being in the most exalted of his possibilities. Ayn Rand said in her writing “The Psycho-Epistemology of Art” that a distinguishing characteristic of a work of art resides in the fact that its purpose serves a human need which is not material but nevertheless inextricably tied to man’s physical survival: the preservation and continued existence of human’s consciousness. Tamara de Lempicka fulfilled this deed to the very hilt. Today’s so-called “art” is not senseless as nowadays “artists” claim it to be but decisively destructive of man’s consciousness. Since the efforts of the artists belonging to the new romantic realist tendency are still in the beginning, it may not come as a surprise that her works are again attracting increased interest and the collectors pay fortunes that even surprise time-worn auctioneers who have seen everything in their houses. Prices of 2 million dollars are no longer an exception for her works and the fact that some of her paintings were recently presented at the Royal Academy of Arts in London and the Kunstforum in Vienna should lead the reader of this writing to look at what Tamara de Lempicka left to the amazed eyes of the viewer. (For examples: http://cgfa.sunsite.dk/lempicka/index.html and http://www.arts-studio.com/tamata-de-lempicka/index.shtml).